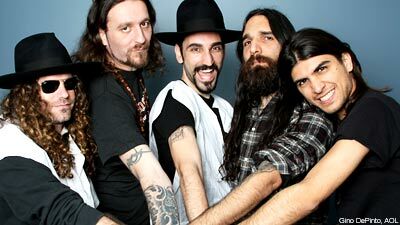 While in New York City for a gig, Israel's Orphaned Land not only visited the M&M store, they donned stage attire, which finds them dressed like Jews, Arabs and Jesus, and strolled through the heavily trafficked Times Square. Any New Yorker can attest to the fact that this normally won't cause natives and non-tourists to bat an eyelash or steal a second glance. "I was like Jesus Chris in the middle, screaming 'Halleluiah,' and people would walk by and not blink an eye," vocalist Kobi Farhi told Noisecreep. "There were a few that were shocked, but others just kept walking." No one said anything rude or inflammatory; there were a few, 'How are you doing, Jesus?' comments sent Farhi's way, but that was about it! "It's this utopic combination and we did it for fun, after sound check, around 5 PM," Farhi said. "We wanted to do it late at night, but going barefoot in middle of the night ... wasn't a good idea!" It sure isn't especially in a germy breeding ground like Times Square! As for the band dressing up and representing the three major monotheistic religions, it's something they do often to stimulate conversation, albeit outside of the 'we've seen it all, been there, done that, bought the T-shirt' mentality of Times Square. "We do it often, depending on our mood," Farhi said. "We like to try and be unique and bring something new. It's obvious to put on Lamb of God [shirt] and sunglasses and look like rock star and it's cool, but everyone can do that. We come from a different place, and we try to reflect that visually and musically." The band admitted to taking a photo of their name on the sign outside of the venue and enjoyed a healthy crowd response -- "to see a core in the crowd, dozens of people singing every single word of a one-and-a-half hour set and seeing Americans, Orthodox Jews, Arabs in the crowd was amazing," Sassi said -- which reminds us all that music is a universal language. It's not to suggest that thousands of years of conflict can be resolved immediately, but the conversations can start with and because of music. "Metal bands feel it more than the New Age bands, since fans are so passionate," Farhi said. "Metal is like a global village, as it doesn't pay attention to culture or color."